Instagram has become a great source of travel inspiration for me, a place that is constantly feeding my travel wish list with new places. The power of beautiful photography to drive travel choices is undeniable. In fact, I would go as far as saying that the emergence of the professional instagramer (influencers that use this picture-based social network to drive marketing campaigns, more or less openly depending on the case) is but the latest iteration of the artistic travel posters of the early decades of the 20th Century (by the way, another category of travel-related creative work that is also popular these days, albeit in the context of a renewed appreciation for all things vintage). However, I have the feeling that brands, and particularly those, like airlines, that aim to build a direct relationship with travellers, are just starting to scratch the surface when it comes to the possibilities that Instagram offers as a sales channel. Instagram does not currently support direct bookings on its platform (and there are no indications that it is going to do so immediately) and, to be fair, this seems to be the case also of other types of shopping. In fact, the “Shopping on Instagram” feature, that the Facebook-owned company offers as part of its Instagram for Business suite of services, currently sends you to the supplier website to complete any transaction. This indirect approach has also been adopted by Easyjet’s pioneering Look and Book feature, that allows people to initiate the booking process with a picture upload. 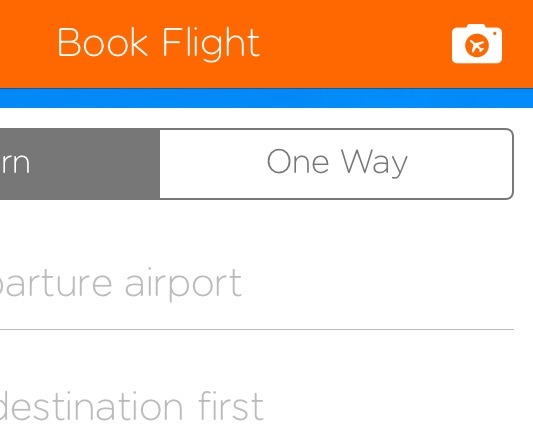 If you go to Easyjet’s mobile app and select “Book Flight” on the main screen to be taken to the typical flight search box, you will notice a small camera icon is on the top right side of the screen, the Look and Book icon. You are then prompted to upload a picture (you will need to grant Easyjet’s app access to your pictures). Easyjet’s app will locate where it was taken and find the nearest airport in the airline’s route network. This is a nice feature, although still far from friction-less. For example, pictures on Easyjet’s Instagram timeline now they carry an orange (of course!) “Look and Book” icon. Contrary to what it looks, this does not take you to a booking page or does not even give you some on-screen information about the “product” (flight+destination), but a reminder (further explained in the picture caption) that you can use the Look and Book feature on the airline’s app (only iOS version so far at the time of writing these lines). Also, despite Instagram acting here as a useful hook element, it must be said that the Look and Book feature in the app works also well with pictures on your phone’s photo roll that are not necessarily on Instagram. I tried it myself and the process was just the same. In this case, though, you are likely to know where the photo was taken and been there yourself before! The value of Instagram in this case is not so much the uniqueness of the process, but that it is an almost unlimited source of new ideas. Don’t get me wrong if I sound unenthusiastic here, I think it is great that Easyjet made took this step forward and also that it recognized the value of pure visual inspiration to drive travel sales, but I will get a lot more excited when I can complete a more or less seamless transaction (without having to switch onto another app, upload pics, etc) the moment that I get inspired by some awesome pictures (and there are so many of these!) that I have just seen on Instagram. The late French startup Flyoff attempted a similar visual inspiration-based approach and added some additional targeting features, such as the possibility for airlines to make ad-hoc offers or offload seats on flights with low demand. Unfortunately, Flyoff is no more (it’s tough for stand-alone apps out there). I guess it is just a matter of time until direct Instagram flight bookings are a reality. This will open quite a few interesting opportunities. Who’s going to monetize these when the pics are not on the airline’s own profile? Are airlines and other travel distribution operators going to bid to get their booking engines connected to the most popular pictures on Instagram? Are individual creators (Instagramers) going to be able to monetize their pictures? Air Italy to promote Made in Italy artisan "gelato"